If you’re a Mothers day breakfast-in-bed kind of family, then you could be on a winner with Mum with this easy recipe for French Toast. With some clever backstage supervision, the kids should be able to whip this one up with collateral damage such as crumbs in the sheets kept to a minimum. While writing this, my thoughts turn to my poor Mum who, with admirable stoicism, endured a number of well meant, but horrendous breakfasts on Mothers Day. My sisters and I, after preparing that special breakfast without Dad’s help, delivered the teetering tray to a smiling Mum, who was sitting up in bed ready and waiting. The breakfast consisted of a large bowl of cold milk, a sparse layer of rice bubbles floating indolently on the top, and lots of sugar laying in wait for the unsuspecting at the bottom. As my older sister handed the tray over, she tripped and Mum ended up with rice bubbles stuck to her eyelashes and swimming in sweet sticky milk. Forever scarred, I can no longer look at rice bubbles in the same way, nor any other liquid based breakfast in bed, with the mandatory, steaming hot, early morning cuppa being the total exception. My firmly held view is breakfast in bed should be toasty, fruity, not too sweet, crumbly or drippy. 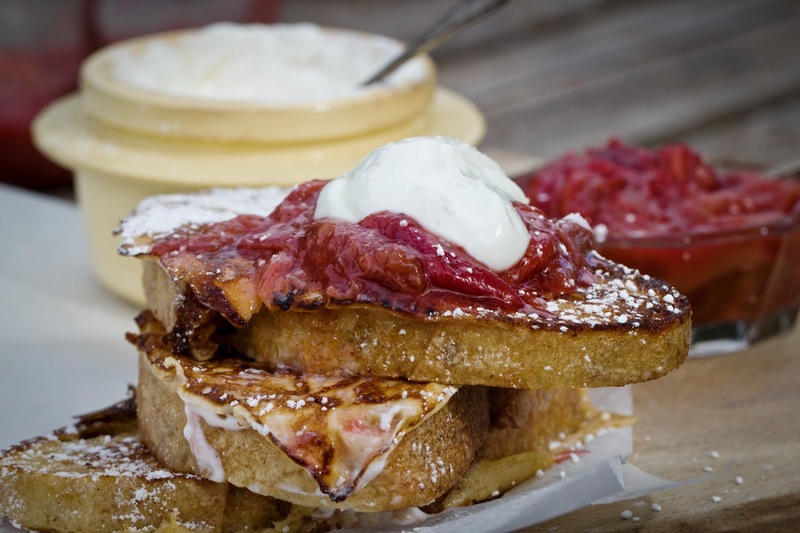 With this rule in mind, this crispy French Toast will work a treat for Mum; it’s low risk and with a little preparation and organisation you can have this cooked, on the brekky tray and on Mum’s lap (with the plate still under it), all within fifteen minutes. The point of difference in this recipe is the addition of flour to the egg mixture. This increases the crispiness factor, which is perfect if you are using slices of a good sourdough or brioche loaf, as it allows the flavour of the bread to shine through. Using day old bread also means the French toast is less likely to fall apart after soaking in the egg mixture. I am partial to the topping of roasted rhubarb, as it’s still quite tart, without the sugar overload that’s best avoided at breakfast. Roast the rhubarb the day or evening before and leave in the fridge overnight to use the following morning. The leftover rhubarb can be kept in the fridge for a week and used to top porridge, muesli, ice cream or just about anything really. Top the whole dish off with a big dollop of creamy Greek yoghurt, and even some good honey to taste if you wish. Finally, a Mums Day tip for kids and Dads; the breakfast in bed experience doesn’t finish with the breakfast on the tray. Think ahead and clean up the dirty dishes as you go. Mum will be pleasantly surprised to see that not only have you served up a delicious, gourmet brekky, but you’ve managed to leave a tidy kitchen as well. Mum, after all that, if you still aren’t a fan of brekky in bed, well, you could always drop some heavy hints for next year. A beauty treatment or massage voucher sans crumbs, sounds awfully good to me. Measure the flour into a wide topped and shallow mixing bowl. Slowly whisk in the milk. Whisk in the salt, eggs, cinnamon, vanilla paste and sugar until smooth. Heat a lightly buttered frying pan over medium heat. Soak bread slices one by one in the egg mixture until saturated. Cook bread on each side until nicely golden brown. If you want to keep the French toast warm while you are cooking the remainder of the slices, heat the oven on very low, and place the cooked French toast in the oven on an oven tray to keep warm. When all the slices have been cooked, serve each slice with a large spoon of roasted rhubarb and a big dollop of creamy yoghurt. If you wish, top with a drizzle of good quality honey. Preheat the oven to 180C and lightly grease a shallow baking dish. Place the chopped rhubarb in the dish. In a small jug, whisk together the honey, orange juice and orange zest. Pour the honey mixture over the rhubarb and mix until well coated. Place the rhubarb into the preheated oven and bake until soft and tender, about fifteen to twenty minutes. When it is cooled to room temperature, place the rhubarb in the fridge until ready to use. First published Canberra Times 8 May 2013. It may seem a little weird, but the new food trend that’s burning through the twitter-sphere at lightning pace is porridge. This surprising trend not only includes your ordinary old Quaker’s Oats, but ancient grains of all descriptions, cooked in every which way. It just so happens that I was born with a porridge spoon in my hand, so I’m completely comfortable with this, but some of you, perhaps those who went to boarding school, may have an aversion to this sticky, goopy substance. And that’s okay, because in the new porridge world, there’s something for everyone. As a spinoff, trendy porridge restaurants are popping up in many cities with many variations on a theme, and food vans are hawking their grains to cold, grateful punters hungrily demanding steaming bowls of congee, jook and porridge. Café Grød, (Grød is Danish for, you guessed it, porridge) is a hip new establishment that has opened in a trendy suburb of Copenhagen. Grød is leading the way with its informal atmosphere and all-things-porridge menu. The Danes are lapping up this cheap, organic, peasant fare, and in true Goldilocks style, porridge aficionados are rolling in for breakfast, lunch and dinner. The specialty at Grød is spelt porridge with apple and toasted almonds topped with a chestnut puree. Open your mind to porridge and you’ll be rewarded by a huge range of grainy possibilities to inspire your creative juices, from buckwheat, rice, semolina, millet, barley, quinoa, oats, spelt, to the lesser known teff, amaranth, tapioca and all kinds of ground legumes. Add any number of things including milk, cream, butter, water, stock, meat, coconut milk, fruit, nuts, spices, fish, sugar, honey or syrup to construct your own gourmet style creations. Inspired by the seasonal creamy, fresh chestnuts appearing at this time of year and with a nod to Grød, I whipped up a millet and apple porridge with chestnut cream and almonds ready to reheat for a chilly weekday morning. Pre-made jars of chestnut puree are available from delis or the Essential Ingredient for about $14, otherwise make your own. It’s a bit fiddly but not difficult. 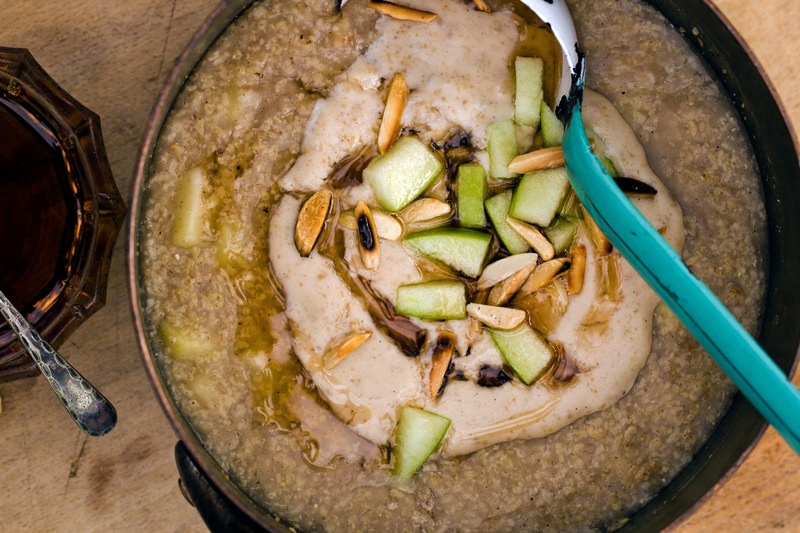 Combine millet, water, apple and spices together in a sauce pan. Stir and bring to a boil and cover and reduce down to a simmer. Let cook for fifteen to twenty minutes until millet and apple is cooked and tender. Stir and check occasionally while cooking, adding extra water as needed if the mixture is too thick. When almost done, add a drizzle of maple syrup and taste. Start on the low end (a teaspoon or two) and continue until you’ve reached a desired sweetness. Place the cream and chestnut puree in a small jug and mix together. Warm in the microwave. Remove from the heat and serve with a large dollop of the warmed chestnut cream and slivers of toasted almonds.